Fiber Optics friendly seawater. Despite operating in such adverse working a well-understood technology dating back 40 years and the conditions, a connector must be absolutely reliable throughout beginning of ? ber optics. The objective is to have a connector that is well-balanced be- approaches use a non-contacting interface to provide higher tween these seemingly “opposite” requirements. This is the durability and tolerance to rough handling, with a small pen- reason why FO connector designers continuously innovate in alty in optical performance. Others provide a high-density, terms of design and integrated optical technology. In the new multi-? ber connection to save space and weight for high-? ber- offshore oil and gas market environment, they are committed count systems, at the expense of some complexity at the con- to bringing FO connector capability and cost-effectiveness as necting interface and pre-alignment mechanism. Drymate connectors are familiar to users of military/aero- a bare ? ber cleaved tip has been repackaged into a downhole space circular connectors. FO drymate connectors can be in- wetmate connector. This epoxy-free and ferrule-less technol- stalled either within a module or between modules that have ogy offers both greater tolerance to high temperature and a been assembled on-site. They are designed for topside mating lower-pro? le dimension in order to ? t into a tight downhole in an atmospheric environment, although they withstand sub- casing. Figure 2 shows FO wetmate connectors developed for sea water and pressures while mated. 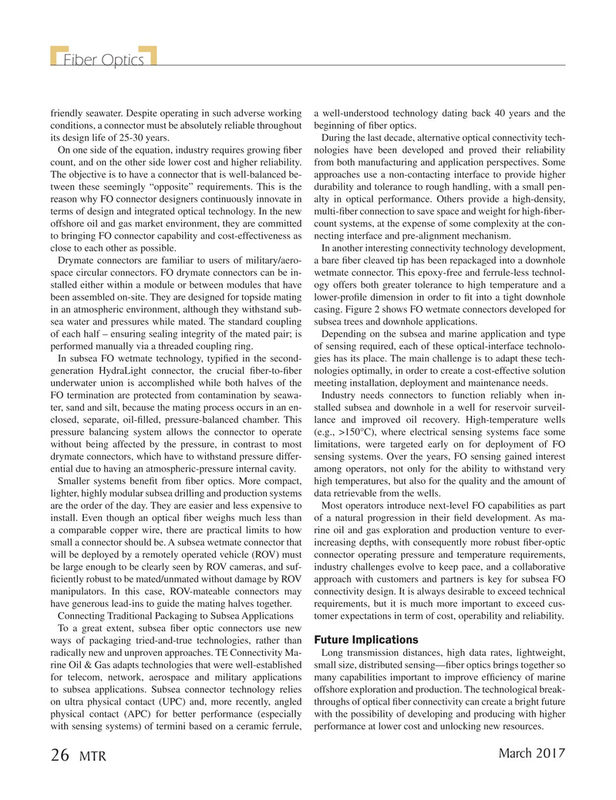 The standard coupling subsea trees and downhole applications. In subsea FO wetmate technology, typi? ed in the second- gies has its place. The main challenge is to adapt these tech- generation HydraLight connector, the crucial ? ber-to-? ber nologies optimally, in order to create a cost-effective solution underwater union is accomplished while both halves of the meeting installation, deployment and maintenance needs. Smaller systems bene? t from ? ber optics. More compact, high temperatures, but also for the quality and the amount of lighter, highly modular subsea drilling and production systems data retrievable from the wells. Connecting Traditional Packaging to Subsea Applications tomer expectations in term of cost, operability and reliability. Future Implications ways of packaging tried-and-true technologies, rather than radically new and unproven approaches. TE Connectivity Ma- Long transmission distances, high data rates, lightweight, rine Oil & Gas adapts technologies that were well-established small size, distributed sensing—? ber optics brings together so for telecom, network, aerospace and military applications many capabilities important to improve ef? ciency of marine to subsea applications. Subsea connector technology relies offshore exploration and production. The technological break- on ultra physical contact (UPC) and, more recently, angled throughs of optical ? ber connectivity can create a bright future physical contact (APC) for better performance (especially with the possibility of developing and producing with higher with sensing systems) of termini based on a ceramic ferrule, performance at lower cost and unlocking new resources.